“A record of spiritual beauty” UNCUT . “Consistently luxuriant and painstakingly produced” Q. You may think GHOSTLAND is a new name. But if you are a serious music lover your record collection almost certainly bulges with records they have played on. Collectively and individually CAROLINE DALE, JUSTIN ADAMS and JOHN REYNOLDS have worked with everyone from Oasis to Bjork and from Sinead O’Connor to Simply Red. Yet despite this glittering array of credits and their in-demand status, the trio have no hesitation in rating GHOSTLAND’s atmospheric and haunting INTERVIEW WITH THE ANGEL the most exciting album they have made in their careers to date. 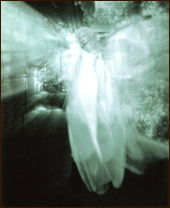 INTERVIEW WITH THE ANGEL builds on their 1998 debut, GHOSTLAND, which was described in a five star review in Uncut magazine as “a stunning soundtrack of beats, ambient stylings and startling dynamics”. The latest album is all of those things – and more. Taking a broad and vivid musical canvas that will appeal to everyone from fans of Enya’s Celtic-pop stylings to students of Gorecki’s symphonic masterpieces, INTERVIEW WITH THE ANGEL is full of instantly memorable melodies, insidiously seductive rhythms, supreme and intuitive musicianship and rich and sultry vocals from a galaxy of invited guests. At the core of the GHOSTLAND sound is producer, writer and programmer extraordinaire JOHN REYNOLDS. A musical mainstay in the career of his ex-partner Sinead O’Connor, his credits also include working with Bjork, Brian Eno, Peter Gabriel and Nusrat Fateh Ali Khan. He is joined by the classically trained CAROLINE DALE, whose virtuoso cello playing and lyrical string arrangements are on first hearing perhaps GHOSTLAND’s most striking musical attribute. Her talents have also been utilised by Led Zeppelin, Oasis and George Michael among others and she provided the music for Hilary and Jackie, the controversial biopic about her very first musical inspiration, Jacqueline du Pre. The third member of the trio is JUSTIN ADAMS, famously dubbed “Britain’s answer to Ry Cooder” for his imaginative and innovative guitar playing. His recent solo album Desert Road generated rave reviews and he’s just as in-demand as his two colleagues, having worked with Jah Wobble, Sinead O’Connor, Lo’Jo, and Robert Plant among others. 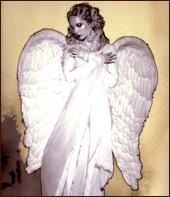 The remarkable voice on Kiss, written by the unjustly neglected seventies singer-songwriter Judee Sill, belongs to JANE SIBERRY; the distinctive tones of SINEAD O’CONNOR can be heard on the magical Angel’s Eyes; LUCINDA DRAYTON sings on ‘In Your Light’ and rising star CARA DILLON contributes her wondrously pure tones to the first single Faith In Love and the beautiful Sacred Touch of Beauty. Lush and romantic, ethereal but charged with a positive energy, INTERVIEW WITH THE ANGEL is an album eloquent with hope and optimism and an irresistible appeal to the dreamer and the poet in us all. On iTunes and Amazon, naturally.